Genuine Cummins low pressure piston lift pump with high volume. Upgrade your 1st gen Dodge 1989-93 Cummins VE injection pump fuel supply to a HVLP pump. If you are looking at other lift/transfer pumps & they don't have Cummins ABFJV cast into them, then they are not OEM Cummins & are just a cheap knock off. This piston pump results in more flow than the standard # 3936320, 3939258 or HFP702 low flow lift piston pumps and approx 50% more flow than the stock std 2118143 diaphram pump. - The standard off the shelf piston lift-pumps produces approx 30 psi @ 2600rpms free-reving and will blow the front fuel seal out of a VE inj pump and push fuel into the front engine gear case, causing oil contamination. - Our genuine cummins modified high flow-low pressure lift-pump produces a safe 14 psi and drops only appox 4 psi under WOT on a heavily fueled engine. (Lines, banjo's, inj's, inj pump mods etc come into play, so your numbers may vary). 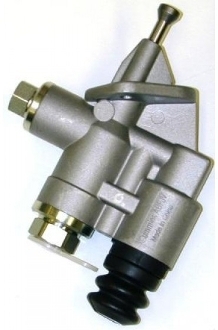 This provides more fuel volume, supporting larger injectors and inj pump mods, while better maintaining feed pressure to your VE injection pump, thus keeping the dynamic timing function of the VE inj pump within proper spec's. Our pump has the correct inlet fitting and safe fuel pressure for your VE inj pump, unlike the std 2nd gen piston lift pumps, which have the wrong inlet fitting size and too high of fuel pressure. Any metering down of a 2nd gen piston pump with a needle valve or snubber, will diminish fuel flow, which is not effiecent at all, seeing as you only gain safe pressure but at the cost of flow. Remaining parts needed to install / retro fit this lift pump on the 1989-93 Cummins 6bt is also sold seperately below for your convienence.